Cathay Pacific tweeted this image of A350 B-LRA taxiing to the gate at Hong Kong. 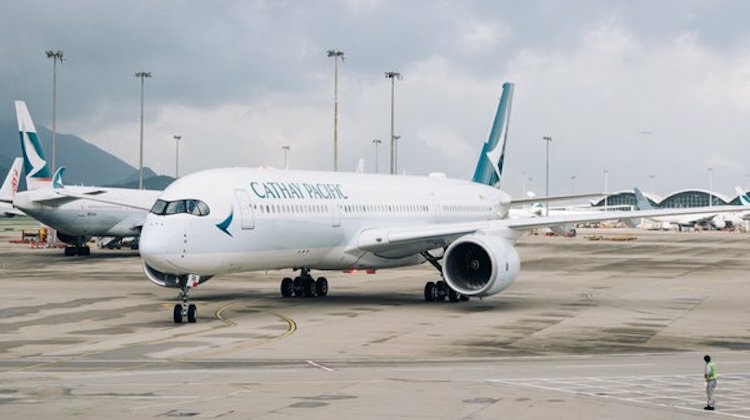 Cathay Pacific has taken delivery of its first Airbus A350, with A350-900 B-LRA touching down at Hong Kong International Airport on Sunday morning after a nonstop flight from Toulouse. Flight tracking website flightradar24.com shows B-LRA departing Toulouse at 2:16pm on Saturday, touching down at Cathay Pacific’s home base of Hong Kong at 7:53am on Sunday, operating as CX3350. The aircraft is due to be formally unveiled to media and staff in a function at Hong Kong Airport on Monday evening. The A350 is planned to enter service with Cathay on June 1, operating to Manila. Daily flights to Manila and Taipei are then planned initially, while the delivery of the airline’s second A350 in July will see services expanded to Bangkok, Singapore, Ho Chi Minh City and Osaka Kansai. Ultimately, after three months in service as Cathay builds up operational experience and crew training on the type the A350 will be deployed on long-haul routes from September, including London and Auckland. B-LRA’s delivery was originally planned for February but had been pushed back due to issues in certifying and manufacturing the aircraft’s Zodiac-supplied business class seat. “The key challenges have been for the supplier to meet a stringent set of seat certification requirements and overcome seat production issues,” Cathay Pacific’s head of A350 project Bob Taylor told the airline’s in-house newspaper CX World recently. Cathay is configuring its A350-900s with 214 economy, 28 premium business seats and 38 business class seats. The Hong Kong airline has 22 A350-900s and 26 A350-1000s on order. Wow. Thought it was a 787 for a second there…. Why is it that in articles about the delivery of new aircraft the engine type is never mentioned. The engines after all are one of the main features. Yes, from this angle they look very alike. Why is it that these new aircraft with very precise aerodynamic designs, then have a box stuck on the top, presumably for TV reception? Don’t they create a whole lot of drag? They look ugly too. Can’t the antennas be integrated into the design?